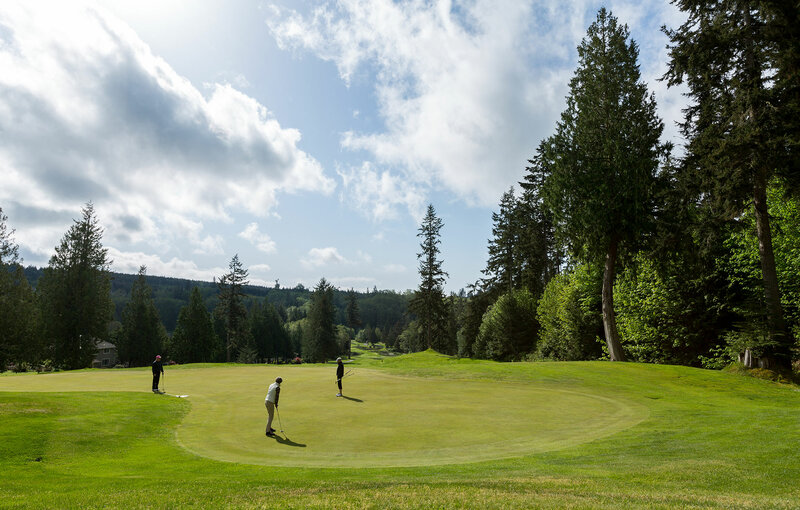 Port Ludlow Golf Course is more than just a golf course. It is the ideal location for your next social gathering. The Golf Course has the perfect setting for your tournament, party, or family reunion. Choose from a menu of activities designed to create memorable experiences and build camaraderie among your group. Players of all skill levels will appreciate the 18-hole championship layout and the course’s rolling fairways. Golfers will enjoy the abundant wildlife and incredible views of Ludlow Bay and the Olympic Mountains. Our Professional Team is committed to the success of your event. We are here to serve you from planning, implementation, and wrap-up. From small corporate or private outings to full tournament groups, we can accommodate any size event. Our course is soft spike facility. Our staff will replace spikes for $11/pair. Hole in One & Tee Prizes are available and tailored to your event. Contact the Tournament Director for pricing and other options to personalize your event. Port Ludlow has the ability to facilitate 120 players with GPS carts. If you need additional carts for players, contact the Tournament Director. Shotgun Start 36 player minimum. Package discounts available depending on the number of players.